A look at factors that determine bond yields. Firstly, bond yields have an inverse relationship with the price of bonds. If demand for bonds rises (and therefore price of a bond goes up), the yield goes down. A £1,000 bond that has an interest rate of 5% – means the government will pay £50 interest payment every year. Therefore, if demand for bond rises, the price of bonds goes up and the yield goes down. Private sector saving. If the private sector has high levels of savings, there will tend to be a higher demand for bonds because they are a good way to make use of savings, and yields will be relatively lower. Savings tend to rise during periods of uncertainty and low growth. Prospects for economic growth. Bonds are an alternative to other forms of investment like shares and private capital. If there is strong economic growth, then the prospect for shares and private investment improves, therefore bonds become relatively less attractive and yields go up. Recession. Similarly, a recession tends to cause a fall in bond yields. This is because, in times of uncertainty and negative growth, people would rather have the security of government bonds – than more risky company shares. Interest rates. If Central Banks cuts base interest rates, this will tend to reduce bond yields as well. Lower interest rates on bank deposits make people look for alternatives such as government bonds. Inflation. If markets fear inflation, then inflation has the capacity to reduce the real value of the bond. If you borrow £1,000 now but have inflation of 20% for the next 10 years, the £1,000 bond will rapidly decrease in value. Therefore, higher inflation will reduce demand for bonds and lead to higher bond yields. 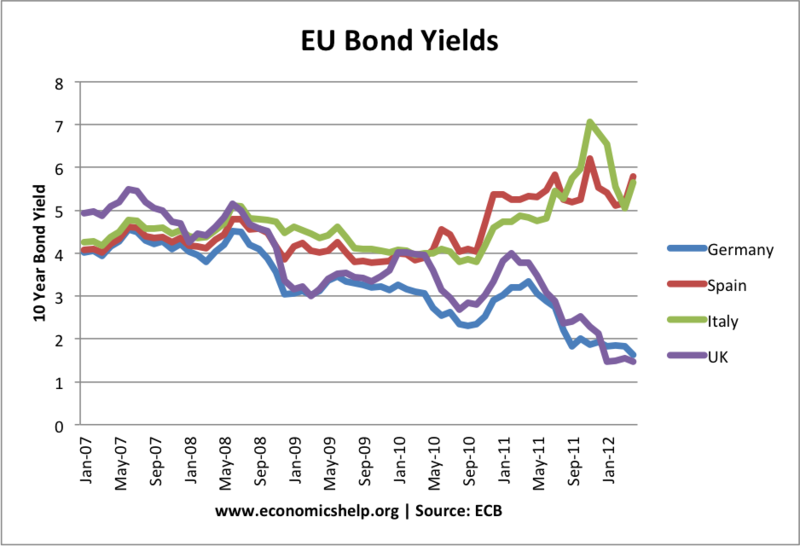 This graph shows bond yields for four countries between 2007 and 2013. 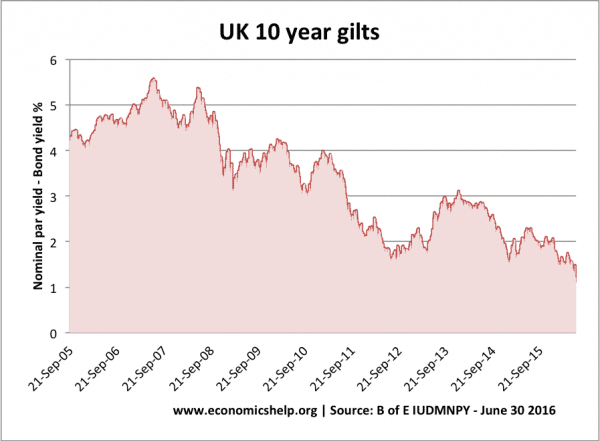 Since 2007, UK bond yields have fallen. This is primarily due to the fact that since the recession, there has been a sharp increase in private sector saving and therefore higher demand for relatively ‘safe’ investments, such as government bonds. Bond yields in Spain and Italy rose because of market fears over possible debt default and illiquidity in the bond market. Because Spain was in Eurozone, they did not have a lender of last resort. (Central bank to create money and buy bonds if necessary). This is why bond yields rose – investor fears rising debt levels could not be financed. Note: Since this period, bond yields in Spain and Italy fell because the ECB has become more willing to intervene in the bond market. 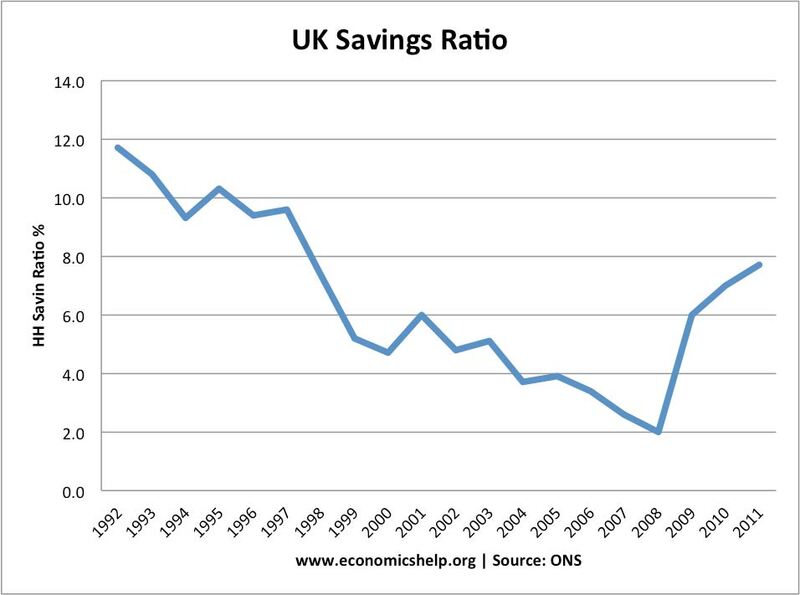 The UK is a good example of how low economic growth and high savings can lead to lower bond yields. With lower economic growth, firms will be making lower profits and paying lower dividends. Therefore, the stock market tends to give a poorer return than usual. Therefore, in a recession bonds look relatively more attractive than usual. A key factor is the level of private savings. Japan has national debt of over 230% of GDP – yet, bond yields are very low. The high level of domestic savings means there is strong demand for Japanese government bonds. 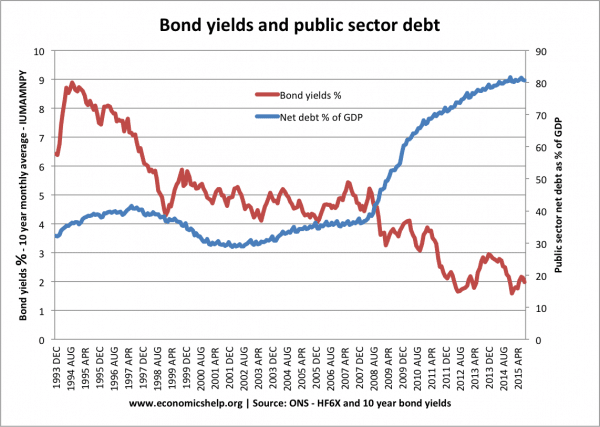 Are there not other Reasons for Low UK Bond Yields in 2012? 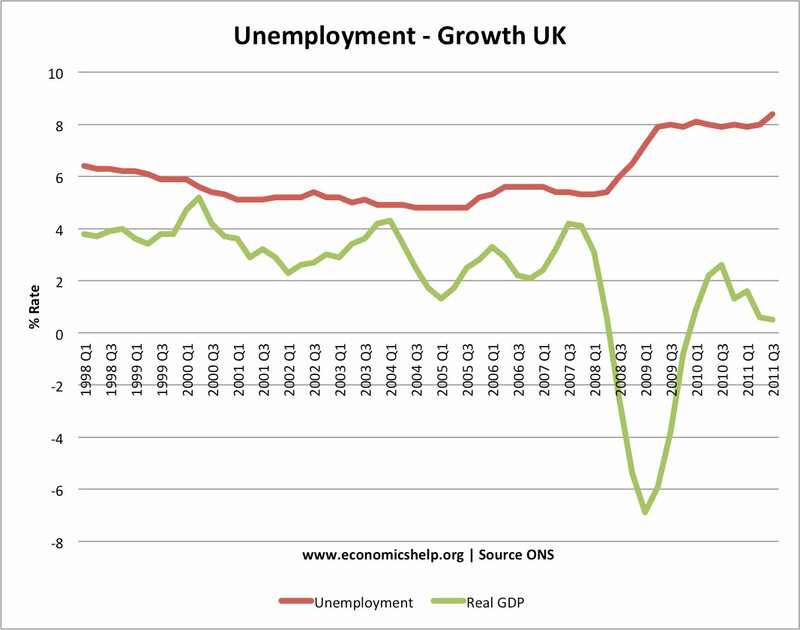 The UK has benefited from uncertainty in the Eurozone. Because investors are nervous about bond yields in southern Europe, this has caused people to sell Spanish bonds and take the relative security of UK bonds. 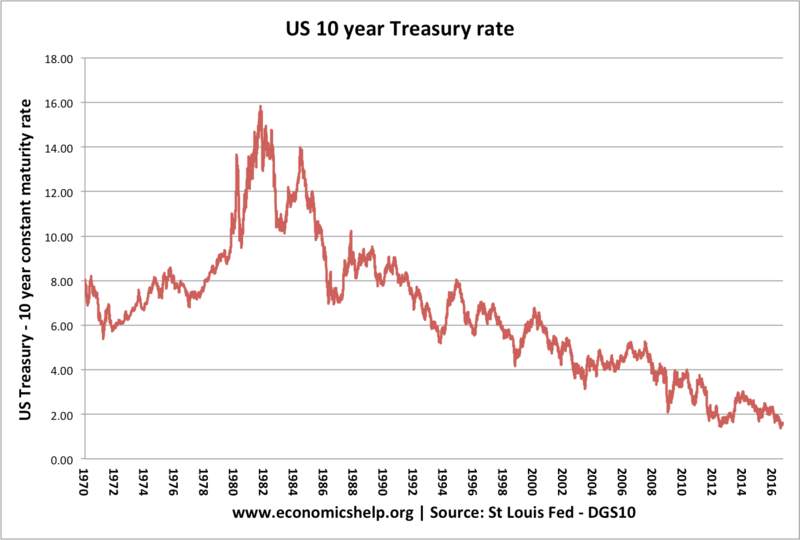 Another example is to look at US bond yields. Since 2007, the US has seen a fall in long-term bond yields. This is partly due to the poor economic growth in the US and relative increase in private sector savings. We are in a liquidity trap where demand for saving is quite high, despite low-interest rates. If the US economy showed signs of a strong economic recovery, you would expect bond yields to rise. This is because, with prospects of economic recovery, investors would move out of bonds and into potentially more profitable areas like stocks, shares and private investment. Why do Italy and Spain have higher bond yields when they face the prospect of recession too? Investors have little confidence in Italy and Spain. This is primarily because they are borrowing in Euros and have no independent Central bank who can act as lender of last resort. Markets fear default in Spain and Italy because of the dynamics of the Single Market. In the case of Spain and Greece, the recession could increase the likelihood of default. Recession leads to plummeting tax revenues and therefore, they fear the government may be unable to meet their borrowing commitments. China buying assets to keep currency undervalued. They don’t mind negative bond yields because the aim is to reduce the value of Chinese currency against the dollar. Poor prospects for global economic growth.